Dave Graham nabbed yet another 2nd ascent of a Daniel Woods V14 at Mt. Evans’ Lincoln Lake with his recent repeat of The Exfoliator. Done running laps on El Cap, Alex Honnold has been busy in the Squamish, BC area. According to his 8a scorecard he’s done Superman (5.14c, soft according to him due to all the kneebars) and Captain America (5.14b) at Check Canyon as well as handful of 5.13 trad routes in Squamish. Speaking of Honnold’s exploits on El Cap, Black Diamond recently published a nice write-up from Honnold about his and Sean Leary’s “triple” that is well worth reading. According to his scorecard, Anthony Chertudi did the FA of Maskerade (5.14b), an alternate start to a 5.14a he put up called Black Chandelier in Logan Canyon, UT. Solo per vecchi guerrieri from Damiano Levati on Vimeo. I was tempted to make a crack about Red Bull after seeing the above video but decided it would have been too easy (and perhaps unfair to the Pou brothers). For those that haven’t heard, Red Bull has been the subject of some criticism lately due to an incident with a film project they sponsored last season in Patagonia. In order to film their athlete David Lama trying to free the Compressor Route on Cerro Torre many bolts and fixed lines were added. This, rightly so, angered a lot of people. You can read all the background on the story here and read David Lama’s explanation here. Will Gadd has an excellent analysis of the situation that is well worth reading here. According to this post on Climbing.com North America will play host to 2 additional World Cups in the 2011 season: a sport climbing comp in October at Boulder’s Movement and a bouldering comp in Canmore, Alberta, Canada in May the week before the event in Vail. Kairn.com reports (in French) that a hold has broken on Realization/Biographie, the route in Ceuse, France made famous by Chris Sharma early in the 2000’s (has it been that long already??). The Google translation is decidedly subpar so it’s hard to tell how much of an impact the breakage will have on the ability of others to send the route. The young French prodigy Enzo Oddo was reportedly close to sending however I haven’t seen anything of late that would indicate he’s been successful. DPM has a nice write-up about an event that took place a few weeks ago at the New River Gorge call Homo Climbtastic which aimed to “celebrate gay pride and unity within the climbing community”. 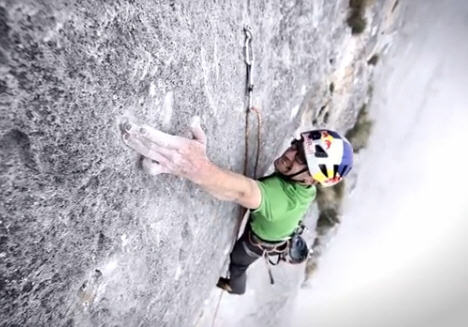 A lot of professional climbers have blogs these days, but they are not all of equal quality. One pro climber blog that really stands out for its consistent quality is that of Sonnie Trotter. Of particular note is his recent post detailing how he spent countless hours cleaning up a new, moderate variation on The Chief in Squamish that goes at the very attainable grade of 5.9. Outside Magazine recently ran a pretty fascinating story written by former Climbing Magazine Editor-in-Chief Matt Samet that chronicles his years long battle with addiction. An interesting followup interview with Samet can be found here. Gregory Packs has a cool post up on their blog about the evolution of internal frame backpacks back in the ‘70s. Boogie ’til You Poop from Cedar Wright on Vimeo. Wow, I don’t remember the last time I laughed this hard. Thanks for the Cedar video Narc! Anyone who can handle that level of embarrassment in such style is freaking cool in my book. Actually laughed out loud. Wow, that Samet article. Soooo heavy. I it was super heavy and eye-opening and a well written article that deserved to be heard. Agreed on Samet’s article. Probably the best writing about climbing I’ve read in a long while (ever?) and it’s not really about climbing at all. Leave a Reply to luke Click here to cancel reply.